“Daphne was a national treasure and a conservation icon. Her legacy is immeasurable and her passing will reverberate far and wide because the difference she has made for conservation in Kenya is unparalleled.”– Angela Sheldrick, Daphne Sheldrick’s Daughter and CEO of the David Sheldrick Wildlife Trust. 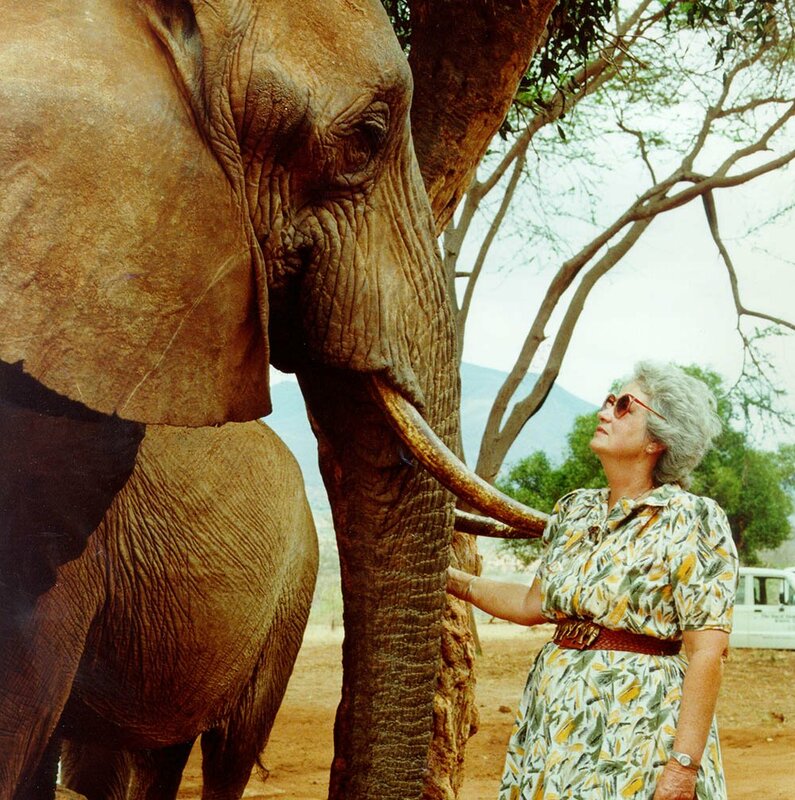 In her 83 years with us, Daphne touched countless lives — from generations of elephants who are thriving today through her trailblazing conservation work, to people all over the world who drew inspiration from her. She is testament to the difference that a single person can make, and her legacy lives on as we continue to protect and preserve wildlife in her memory. Below, we invite you to share your own story of how Daphne touched your life. It is a heavy heart that I read this news she is an icon to the world. I send my condolences to you all family and friends take comfort that she was loved and respected for her work. I send healing prayers to heal you during this sad time. Deepest condolences to Dame Daphne’s family. She left a wonderful legacy and will never be forgotten. Sincere condolences on the passing of a beautiful soul. Her contribution to wildlife esp. elephants was immeasurable. Thank you Daphne for all the work you did to improve the lives of the orphans. You are and will always be my hero. May you rest in peace with all your beloved animals. I donated a small symbolic amount in recognition of the great works and exceptional life of Dame Daphne Sheldrick. Her sincerely kind words and outstanding accomplishments in the elephant orphanage in Kenya touched my life. I am saddened by her death particularly since it occurred on the day when we observed the 20th anniversary of my own mother’s passing also of breast cancer. She was born just a year earlier as Mrs. Sheldrick. Thus this note is in the memory of both my mother and Daphne Sheldrick. Elephants are among the loveliest creatures in the animal kingdom. I as a neurologist and molecular genetic researcher greatly admire their exceptional intelligence. I wish you much success in your invaluable works in Kenya. My deepest condolences. May her memory be a blessing. My visit to Kenya and the DWST has changed my life and my appreciation for the wild animals that this earth has been blessed with. I know you will continue her brilliant legacy with love. My deepest condolences. She was one of my heroes. I’m grateful I was able to meet her back in December 2015. I’m sorry for your loss. Godspeed Daphne Sheldrick! Thank you Dame Daphne Sheldrick for your dedication to wildlife and for the legacy you leave to us. May you rest in peace with your beloved husband and watch over the orphans in need. Daphne Sheldrick was an inspiration to me and many others. I visited the orphanage in 2012 with my daughter and granddaughters and I am very glad I did as I had watched films and read books about her work and I am so thankful she was able to save so many animal lives. Am very sad for the family and the world of animal lovers. Deepest sympathy to you. Thank you Daphne! We know that Angela will carry the flag! Oh what a SAD SAD day for all the elephants and her family and staff in Kenya. I feel shocked and heartbroken…..as if I knew her personally which I did not. But have been a close watcher of all that she did at her wonderful centre. Thank you Daphne for all your dedication and love of all wildlife and specially elephants and rhinos. I will continue to donate to the Trust regularly. My heartfelt condolences to her family and all who work at the centre. She will be GREATLY missed. Without knowing her other through all that I’ve read I have felt a deep kinship with you mom. There is such character in her face such indomitable spirit and a kindness that radiates. I am deeply saddened by her passing though I am also certain her spirit will live and inform so many of us and will guard her beloved elephants and rhinos and all others. It’s a very sad day today and my heart goes out to Dame Daphne’s family both human and elephant. However I’m sure her legacy will live on and many more elephant friends will live happy and secure lives because of her. What a wonderful legacy Dame Daphne has left. Please accept my sincere condolences. May she rest in eternal peace. the work she founded for the protection of wildlife.